The Evil DM: This is how I roll! : The Evil GM - Oh no, that magic item... SIGH. I tend toward keeping magic-items on the weak side in my games to begin with, however I suspect if the problem did come up, there could be logical in-game ways that the world itself will deal with an imbalance of power just like in the real world. Maybe monsters start banding together to form alliances for mutual protection against that overpowered weapon the PCs have. Maybe the monsters put a bounty on "that pesky human wielding item x." Maybe the monsters, after a reasonable time, develop a countermeasure to the item is. Or perhaps the local monarch is disturbed by the sudden excess power the PCs have and his paranoia slowly begins to turn into action. But I don't think I'd ever take something away (in godlike fashion) once the PCs acquired it. And rather than thinking I'd broken my campaign, I'd just let the world run its course and allow the redress of the power imbalance to occur naturally as it would in the real world. If you run a low information game, you have your problem solved. 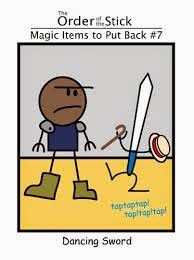 Your players determine they have a Dancing Sword, but after realizing havoc it's causing, so you give it 20 charges and every time it's used more than once a day, a charge is consumed. As long as they don't abuse the thing, it can last a long time. If it turns into their new go-to solution for every nuisance encounter, then they will quickly find themselves with a regular magic blade.